The first North Korean to be arrested over Kim Jong-nam's death was named as Ri Jong Chol, 46. Police believe poison was sprayed into Mr Kim's face as he waited to board a flight from Kuala Lumpur to Macau. A grainy image taken from security camera footage, which has been broadcast in South Korea and Malaysia, shows a woman wearing a white T-shirt with the letters "LOL" written on the front. Police have now finished Kim Jong-nam's post-mortem examination, though the results have not yet been made public. It has demanded that Malaysia immediately release the body. Malaysia is refusing to do so until it receives a DNA sample from Mr Kim's next-of-kin. 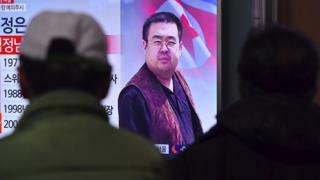 South Korea's intelligence agency has accused the country's rivals in the north of assassinating Kim Jong-nam, saying Pyongyang had wanted to kill him for years but that he was being protected by China. He had spoken out in the past against his family's dynastic control of North Korea and in a 2012 book was quoted as saying he believed his younger half-brother lacked leadership qualities.